You guys, it’s been summer in Michigan like whoa. And honestly the thought of turning on the oven for ONE WHOLE HOUR to eat banana bread is just too much to bear. (Or at least until I give up on stayin’ cool). Don’t fret though! 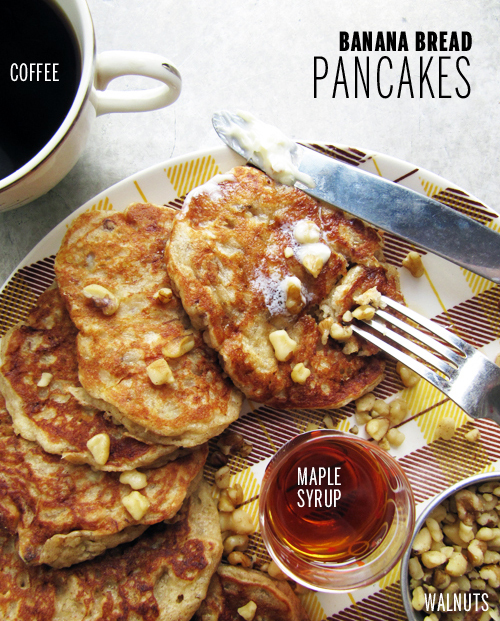 These pancakes solve that banana bread debacle in one awesome breakfast eatin’ swoop. And with a little bit of butter on each warm pancake, they just really and truly taste like banana bread straight from the oven. 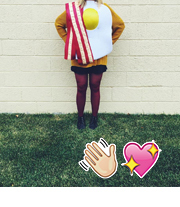 Just consider these banana bread in a pancake outfits. Flatty patties. Solvin’ problems, you guys, one pancake at a time. 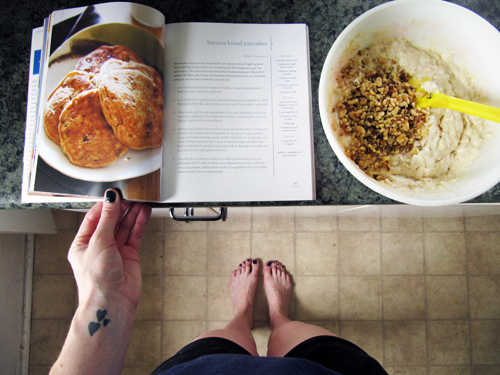 So, I’m just really excited to have gotten Adrianna’s Pancakes cookbook. You see, she knows her way around a pancake. I mean, her whole book is dedicated to sweet and savory pancakes alike! (SUCH a good idea.) I totally recommend it. The first ones I made from her cookbook were the straight up buttermilk guys. I ate them for dinner, standing in my kitchen all Pretty Woman-like (but without the prostitute side story). I cooked them up with blueberries and raspberries. These were my second ones and you better believe I’m going to be making plenty more. Brinner forever. In a medium bowl whisk together the dry ingredients. In a smaller boil whisk together the wet ingredients. All at once add the wet to the dry and mix until just combined. Fold in the walnuts. Preheat your skillet over medium heat and brush with butter or oil. Using 1/4 cup measuring spoon, scoop the batter onto the warm skillet. Cook for 2-3 minutes or until small bubbles form on the surface of the pancakes, then flip. Cook on opposite side for 1-2 minutes, or until golden brown. Transfer cooked pancakes to a baking sheet in a 200F oven. Repeat until all the pancakes are done. Serve with butter, maple syrup, and more walnuts. I want to eat breakfast in your life forever. It seems like the magical land of breakfast, where every meal is breakfast, and it’s all amazing and there’s ice cream too. 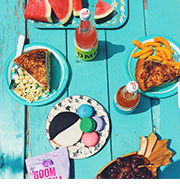 Breakfast Dreamz. Banana bread pancakes are the best! Love them so much!! Heck yes! Thanks, Tieghan. Breakfast love for all! YES. Those would totally both be a super good addition. Maybe even a peanut butter syrup? I can’t tell you how happy this recipe makes my tummy. What a yummy idea! Oh, Sandi! You’re just makin’ my day with comments like this. If we were neighbz I’d totally invite you over for a pancake party. Oh Yea Hell Yea.. Pancakes all day. Oh and I’m moving in with you because your breakfast is better than Waffle House. Pancakes for our whole life. Can’t wait for you to move in! I’ll make pancakes and you fry the chicken. Love! 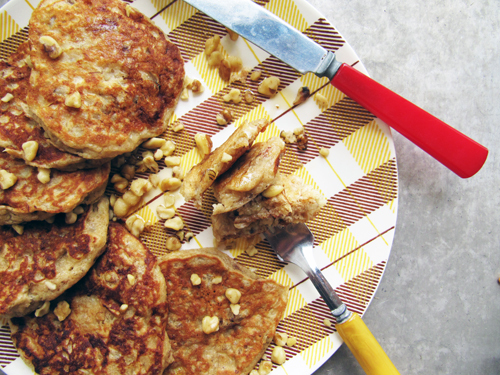 Banana bread pancakes rank right up there with blueberry or carrot cake pancakes!!! I could eat pancakes for every single meal, for sure! You know what’s up, Stefanie! We should go on the pancake diet. HECK YES! I love these pancakes so glad you loved ’em too! YAY! <3!! They are a banana bread miracle! Thanks for having mad skillz, Adrianna! This is clever! No need to turn on the oven to get banana bread at all. I am tempted to make pancake brownies just so I can have brownies in a flash. I’ve got every ingredient to make these pancakes except bananas. -_-” Soon, I will. I love when the ingredients are on hand. Totally means it’s meant to be. Oh, Megan, this Michigan heat has been killing me! Though we have had a lovely few days 🙂 I love banana bread more than a normal person should and but never thought to make the delicious stuff into pancakes. Needless to say, I am super pumped about these! Right?! I’m so glad this week is breezy and awesome! It’s perfect baking (and napping) weather! 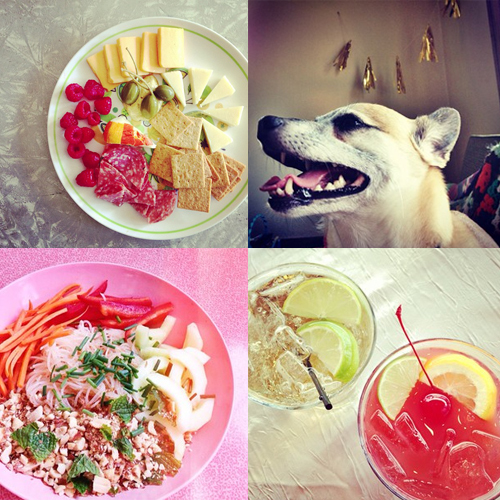 girl, you know how to do weekend breakfast up right! This summer has been pretty brutal in the heat and rain department, but these banana bread pancakes make it all better! So pretty! Yay for pancakes! These look great and like the perfect banana bread substitute. What a great idea. My sister is vising soon and I always like to do pancakes at least one morning! Thanks, Tracy! You’ve got a lucky sister! Um, yes please. Pass me a plate of these!! They sound delicious. I could eat plate after plate of this deliciousness. I think you may have included a typo for the coconut oil. It says 3/4 cup, but that seemed like a lot so I double checked on Adrianna’s cookbook that you reference. She calls for 1/4 cup of oil. I just wanted to mention it to ensure everyone ends up with an awesome result. Thank you for sharing this recipe. Im excited to share it with my family. You’re so right, Cameron! It’s fixed now. Thank you so much! Hi, these look amazing thank for sharing we are going to make these Sun. I make and freeze pancakes all the time. Just a nice alternative to cereal for my kids on school mornings. Can these be frozen as this isn’t your typical generic pancake recipe (additional wet ingreds. have me wondering) it is the MOTHER LOAD of pancake recipes? Thanks again for taking the time to share this recipe.